You do need to be an experienced chef to prepare homemade, paper-thin filo (phyllo) sheets. 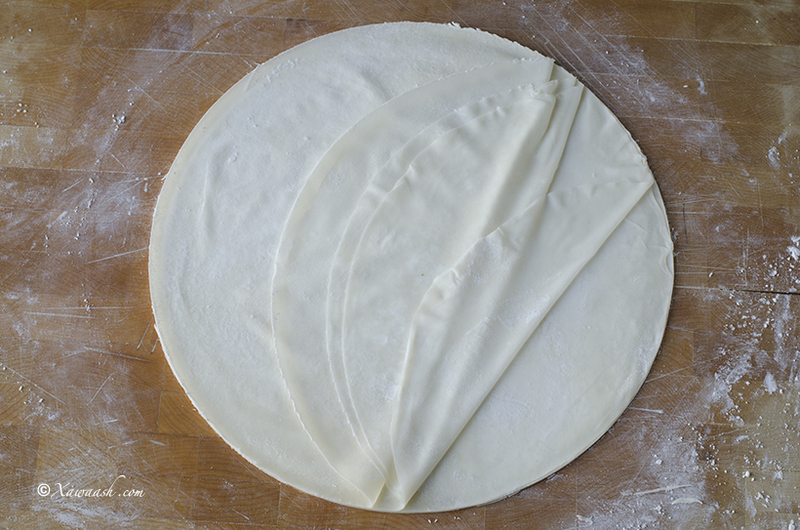 You do not need to stretch, and stretch, and stretch the dough. Our easy-to-follow, step-by-step instructions will give you guaranteed results. 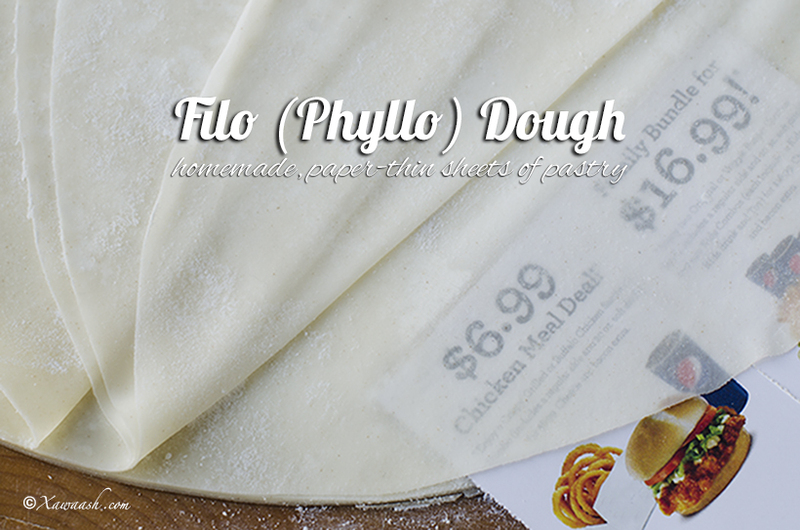 Filo dough can be used to prepare different kinds of dishes. 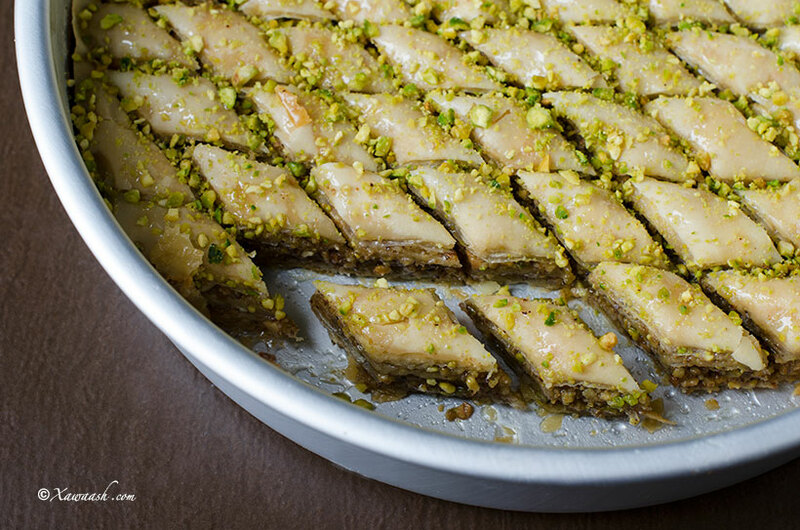 It is used for many types of sweets such as baklava and it is also used in savoury dishes such as spanakopita. We hope to post several recipes that use these homemade filo sheets. Homemade filo sheets have several advantages over frozen ones. 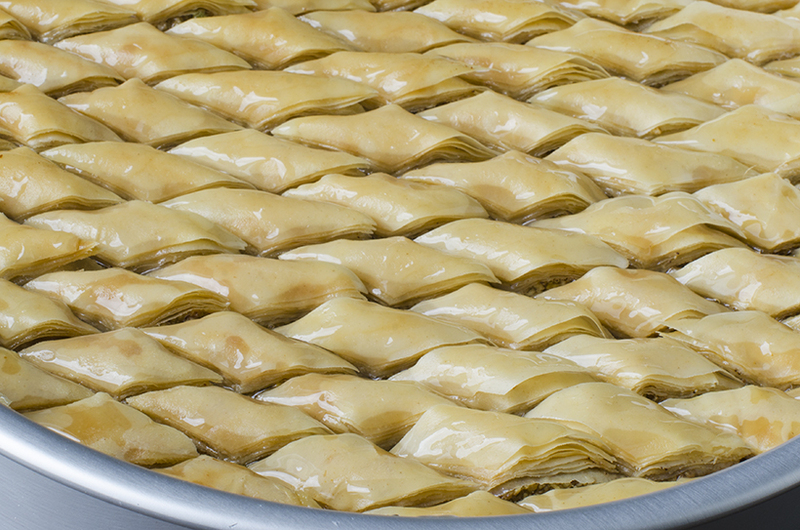 While frozen filo is convenient, it is more difficult to work with as it dries faster. Dishes made with fresh filo taste much better and you will be able to tell the difference. Another advantage is that homemade filo has no preservatives and you know all the ingredients that went into it. In a bowl, combine 2 cups flour, baking powder, salt, unsalted butter, milk and vinegar. 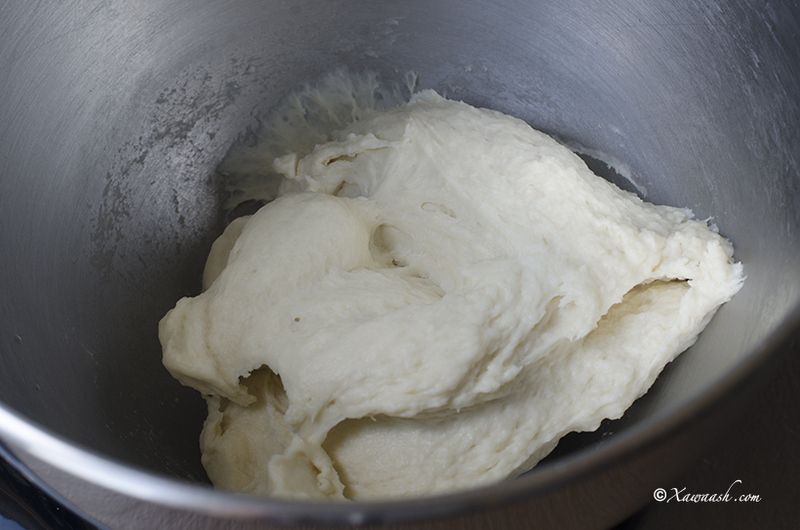 Knead for 5 minutes using a mixer, or knead by hand for 10 minutes. Mix 1 cup corn starch and 2 tablespoons flour and set aside. 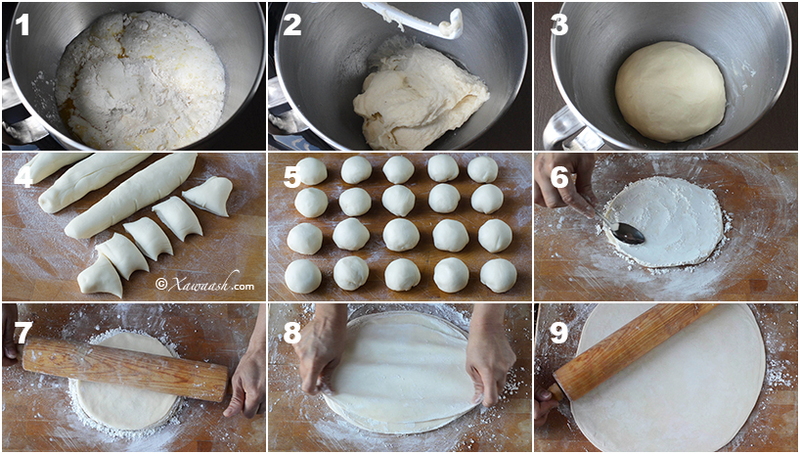 Divide the dough into 4 pieces and shape into logs. Divide each log into 5 pieces, making 20 pieces in total. 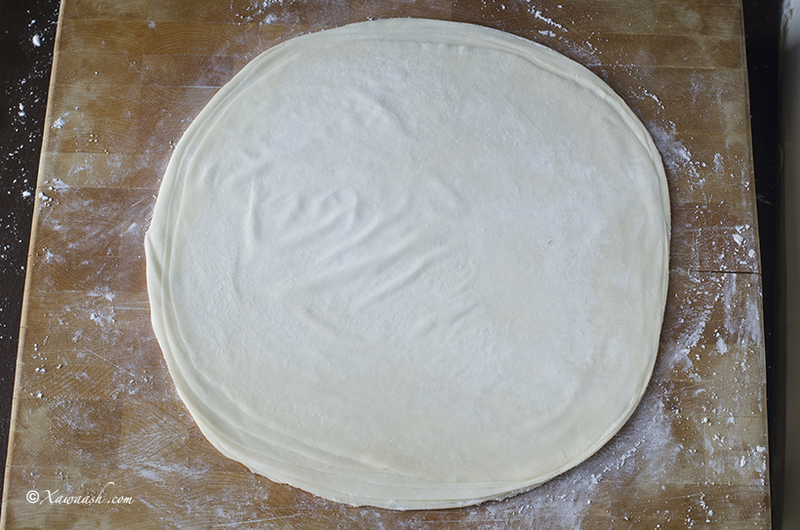 Roll each piece to a 6½-inch (16.5 cm) circle. 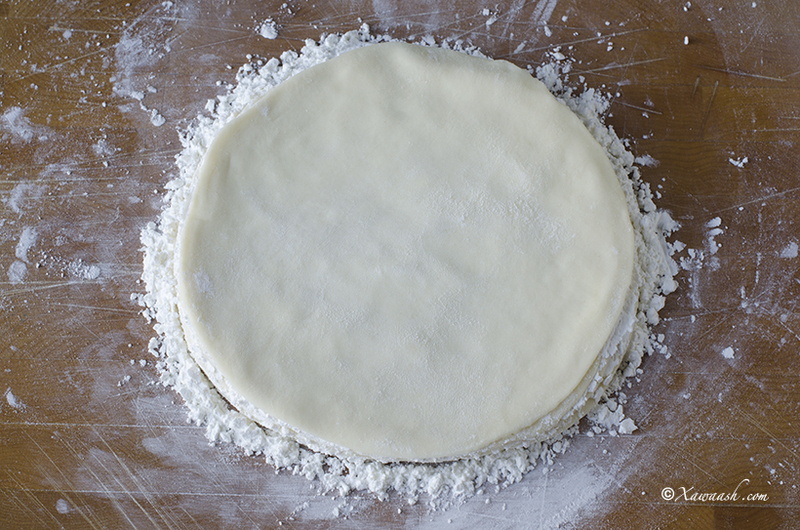 Stack 10 circles with 1 teaspoon corn starch in between each layer. Do the same with the other 10. 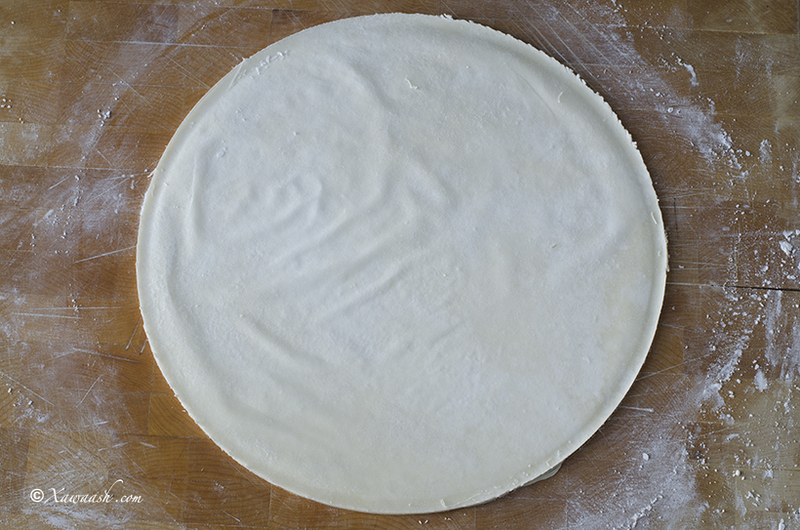 Roll out carefully and apply even pressure on the dough. Flip and stretch any short pieces with your hand. Roll out to a 15-inch (38 cm) circle. Wrap it with plastic and refrigerate or freeze. Isku dar 2 koob bur, beekin baawdarka, cusbada, buurada, caanaha iyo qalka. Makiinad ku rifaaq muddo 5 daqiiqo, ama gacan ku rifaaq muddo 10 daqiiqo. Cajiinka dhig muddo 30 daqiiqo. Isku qas 1 koob waraango iyo 2 qaaddo weyn bur, dhinacna dhig. Cajiinka 4 gabal u qaybi. Gabal walba 5 u qaybi. 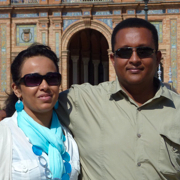 Sidaas tirada waxay noqonaysaa 20 gabal. Cajiinka kuuskuus oo sida kubbad ka dhig. Gabal walba u fidi wareeg cabbirkiisa yahay 16.5 sentimitir. Gabal walba 1 qaaddo yar waraanga ku shub, kaddibna 10 kii xabbaba is kor saar. Wada geddi, wixii gaabanna gacanta ku kala jiid. U fidi wareeg cabbirkiisa yahay 38 sentimitir. Bac ku duub, kaddibna qaboojiyaha ama barafka geli. This is fantastic! It will take me some practice to get mine as good as yours, but it still worked well on my first try. I used this dough to make apple strudel and it was really yummy. Next time i’m going for the baklava recipe. We are happy you liked it. Thank you for the comment. Alsalamu alaikum. I am wondering why you stopped your posts suddenly. Hope all is well. It appears that they just opened a restaurant in their hometown in Canada. I guess they are now quite busy. See Facebook Page. Pity its unlikely I will visit Canada again. 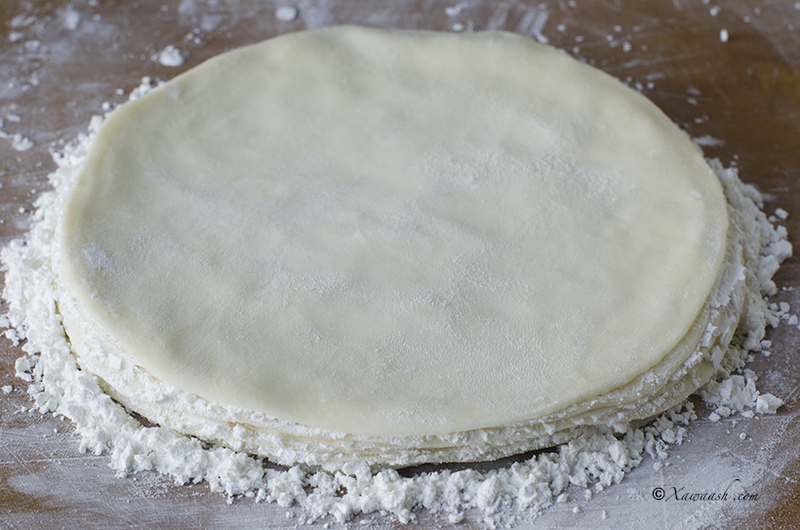 Best way to do this is to use thin fillodough if you can find it in your food market freezer.